FiiO puts the pedal to the metal with their new portable headphone amp. Convincing people to carry around a portable amplifier in addition to a phone is a bit like asking Usain Bolt to strap rockets to his feet. Yes, it will technically make him faster, but it’s also cumbersome and annoying, and will probably explode. While that last part doesn’t apply to audio equipment (most of the time) it’s a problem that companies like FiiO are trying to solve. With their latest, the Q5, they’ve made some of the biggest strides yet. In this review, we break down the Q5’s sound, design, packaging and accessories, specs and more. To see alternatives, check out our list of the best headphone amps. The FiiO Q5 is what happened when they went back to the drawing board after a good night’s sleep and a few cups of very strong coffee. It packs a ton of features into a light, portable frame that offers both wired and wireless connections, and it’s absolutely fantastic. The biggest problem with carrying around an additional amp for your phone is that you have to make sacrifices. You either resign yourself to the fact that you’re going to be dealing with multiple cables, in order to get an amp with enough features and audio quality to be worth your time, or you go the full Bluetooth route, and accept that the convenience means you probably aren’t going to be getting top-notch sound. Up until recently, getting a fully-featured portable amp meant doing awkward things like strapping it to the back of your phone using rubber bands – a solution that FiiO themselves utilised with products like the A5 (full review here). Sure, it worked, but it felt like something FiiO only did because they couldn’t come up with anything better. Another big problem with portable apps is that usually, the sound quality isn’t as high-resolution as we’d like. Yes, plenty transmit aptX Bluetooth – currently one of the best standards available – but you don’t get things like advanced sample rates, or DSD compatibility. That’s definitely not a problem with the Q5. The circuitry inside it can handle audio up to 32 bit / 384 kHz, as well as handling DSD up to 256 standard. While those figures won’t mean much to all but the most geeky of all your heads, all you need to know is that the Q5 can handle very large audio files without breaking a sweat, meaning you get a significant uptick in quality. For comparison, the Sony PHA1A, which is in a similar price bracket, only takes up to 24 bit / 192 kHz audio. The many wired connections, plus the included aptX Bluetooth, all spell good things for the audio quality. It is, very obviously, a huge leap up in quality from anything your phone can produce. The audio that comes across, which doesn’t change significantly when you move from wired to wireless, is balanced, refined, and classy. The music feels like it’s been polished to a mirror sheen, without any additional color or processing added. While it wasn’t as aggressively neutral as some amps, we definitely felt like we were hearing the music, rather than the machine. In many ways, this sticks with the whole design philosophy of this amp, which is to involve as many people as possible. What better way to do that then by increasing the overall quality of the music, without getting in the way of it? We’re into that - as you can tell from our full, in-depth review of the Schiit Magni 3 amplifier, where we praised it in a similar way. The Q5 also felt relatively forgiving, smoothing out any harshness that we encountered in the sound, meaning that we were comfortable listening to it for quite some time. However, we don’t think that it really needed a bass boost function, accessed by a switch on top of the unit; there was a definite bump in the low end, but it felt a little bit superfluous, and we barely notice its absence when it was turned off. Of course, you could just ignore it if you felt so inclined. As we mentioned before, there’s a gain switch that allows you to compensate for headphones of various sensitivity. This is always a nice function to have, especially given the range of headphones this thing can take. The balanced output handles anything from 16-300 ohms of impedance, while you’re restricted to 16-150 ohms with the regular 3.5 mm output (if you need an explanation of these terms, we’ve got one here). These aren’t huge numbers, but will cover all but the most demanding pairs of cans. Like the design, everything here has the feeling of smooth, calm competence. And although we didn’t have a separate amp module to test, swapping out the included one was so simple that we really wanted to experiment. In terms of audio quality, then, the Q5 hardly puts a foot wrong. The controls are all around the edges, and all are well-designed and distinctive enough to impress, without ever detracting from the overall effect. And as we mentioned, there are a ton of options here. To wit: on top, you get a gain switch, a bass switch, an optical/coax line in, and a line out. 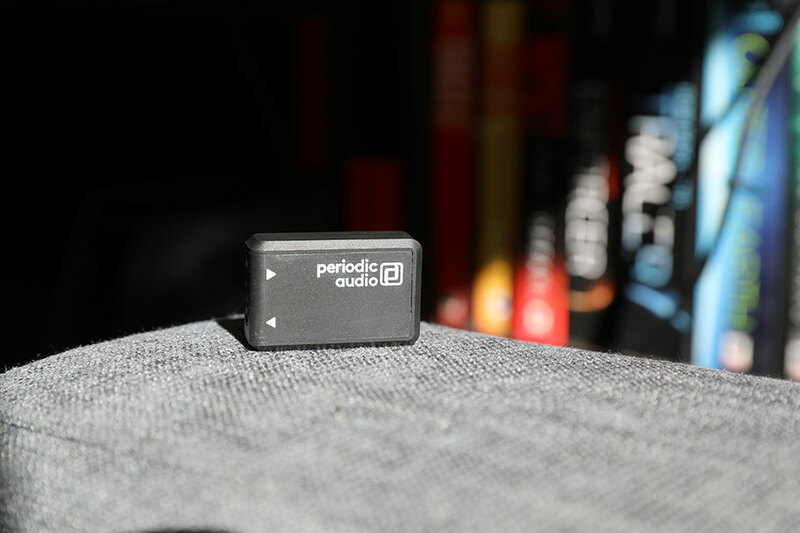 A knurled, red-edged volume knob – something of a company trademark – sits recessed on one side, with the metal angled so that your thumb can easily find it. There is a clearly labelled power button next to it, and a DSD indicator below it (you can find a full explained on various audio file formats here). On the bottom, you’ll find both a balanced headphone output and a standard 3.5mm one, as well as a USB data port. There’s also a second USB port on the body, which just handles charging (because, why the hell not?) But the key feature is on the opposite side of the volume knob: a set of track controls. In the past, portable Bluetooth amps either relied on a single button for all of these functions (which, in their defence, mostly works quite well - the old OPPO HA2-SE is a good example of this, although it's no longer available to buy). There are other fun bits, too. Turn the unit on, and a bar below the slab of brushed metal glows a series of colours, all of which communicate a different state depending on which input you’re using. It looks absolutely terrific, and adds to the impression that this is a premium piece of equipment. And if you like, you can take your audio quality further and actually swap out the amplification circuitry for another module. All you have to do is use the included screwdriver to disconnect the rectangular amp module at the bottom of the unit – it’s an AM3A, one of FiiO’s standard amp modules - pull it out, and attach another. 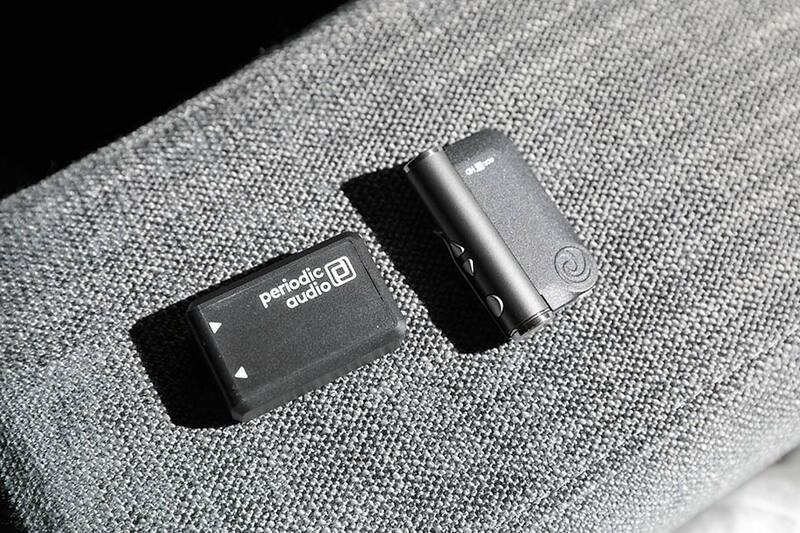 FiiO offer several, and this is a sweet, well-thought-out way of doing things. Want to plug and play? You can. Want to get creative and start swapping out modules? You can do that too. The design of the Q5 means that it can be as complex or simple as you want it to be. So many pieces of audio equipment insist you do things their way – speaker and amp manufacturers are particularly guilty of this – but it simply isn’t a problem here. Wired? Wireless? Fine-tuning the sound? Leaving things as is? Whatever you want. A few bits of housekeeping. Battery life was good, if not spectacular – we got eight and a half hours out of the Q5, with music playing at a moderate volume, before we needed to recharge. The aforementioned A5 had thirteen, so this is definitely a step back, albeit not a horrendous one. Recharging itself took a couple of hours. It’s worth noting that if you connect to a device via USB, the Q5 will rely on its own charge, rather than draining the battery of that device – handy if you want to save some power. Warranty wise, while we don’t see the robust device breaking down any time soon, we do wish that the company’s warranty terms were a bit better: a month for faults in the body, and free maintenance for up to a year, doesn’t really seem all that generous. Still, nothing’s perfect. Since we first wrote this review, FiiO have announced that they're releasing an updated version of the Q5 - the Q5S. It has a similar design, including the swappable amp modules, but comes with significant improvements. Among these, you'll find a new dual-DAC, and an increase in file size handling. We've been promised a review model, but FiiO don't have a release date or pricing yet. It may be worth waiting for the new model to drop, although the original Q5 is still an excellent proposition. When we opened the slim black box that the Q5 came in, we didn’t expect much. A carry case, maybe. A charging cable. We’d been conditioned by a dozen boring portable amps to expect very little, which is why it was nothing short of startling when we lifted off the foam insert and had a billion things come tumbling out. Here is what you get when you buy a Q5: a Lightning-to-micro USB cable, for use with Apple devices; a standard micro-USB cable; two different types of 3.5mm cable; an optical connector; the aforementioned screwdriver for when you want to get creative with your amplifier module choices; spare screws for when you inevitably lose the ones currently in use. We have never seen this many bits - not even in the VIZIO SB4051 soundbar (full review here) which had cables coming out of its backside. And that’s just for starters. You also get a very funky mesh carry case to put all this in. You get a nonslip mat (yay?). You even – and we genuinely can’t believe this – get a pair of those old branded rubber bands that you can use to attach the Q5 to the back of your phone, if you’re an insane person. Perhaps that’s what the ugly leather pad on the back is for, so you don’t scratch up your device. These accessories cover just about every eventuality. We are very confident in saying that you will have to buy absolutely nothing else once you’ve bought the Q5, in order to get it working. There is nothing you can throw at it that isn’t covered by this cornucopia of accessories. 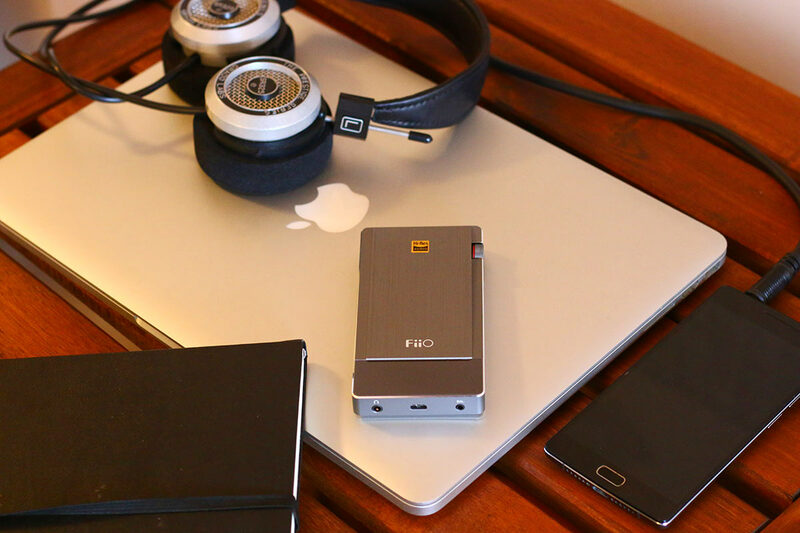 The FiiO Q5 has stellar design and looks - it’s one of the coolest portable amps we’ve tested. It has a huge range of features. Seriously: this thing can do anything. The amp delivers good if unspectacular sound, which should satisfy most people. ​We’ve never seen this many accessories. Mostly, we think this is a good thing. Some of the accessories are a little bit strange. Why do we have to pay for a leather slipmat? The leather backing functions well enough, but doesn’t look great. If you want a portable amp, but don’t want the size or price or additional functionality that the Q5 offers, look no further than the BlueWave GET (full review here) manage to perform a tricky balancing act between portability and sound quality, utilising things like aptX Bluetooth. But u. This tiny amp from an independent Montréal company is just terrific, offering a lightweight alternative that performs very well indeed. It’s an aptX-equipped amp that is exceedingly simple to use and operate, and will set you back less than hundred dollars. While we do wish the construction was a little bit more sturdy, it’s still one of our favourite amps. And at $99, it’s a fraction of the price of the $350 Q5. Sony’s cigarette-pack-shaped Sony PHA1A Is getting a little old now, and it definitely doesn’t offer the mod cons that something like the Q5 – no Bluetooth, for one thing – but we still like it. It’s got a slightly old school charm, and despite the need to attach it to your phone with those damn rubber bands, it’s light enough that it shouldn’t be too big an issue. Definitely check it out, if the OPPO or FiiO models aren’t available. At $298, it’s a little bit cheaper, too. As for FiiO’s other amps, we’d say steer clear of the A5 for now. It’s way too old, and the Q5 betters it. They do offer plenty of alternatives, like the BTR1. This is arguably closer to the BlueWave GET than the Q5, as it’s a tiny portable amp - and for the record, we think the GET is more fun - but it’s still a viable alternative. It’s also the cheapest amp here, at about $50. Compare that to $99 for the GET, and $350 for the Q5. However, as far as we are concerned, the Q5 is about the best portable amp you can get. And yet, our biggest worry about it is that it won’t take off, simply because there’s one problem it can’t solve: it’s a portable amp. You’ve got to really work hard, as we already mentioned, to convince people to hump around another piece of kit. While we are absolutely convinced that this is a really good way to go about it, and we don’t believe the company could have done anything else to improve the experience here, we just worry that it won’t get the audience it deserves. For one thing, it’s reasonably pricey; $350 is quite reasonable, if you’re an audiophile. But if you’re just getting started in this particular world, then it’s a lot to shell out for yet another thing to put in your pocket. We really want this amp to sell like gangbusters. It absolutely deserves it, and when we next update our list of the best headphone amps, this is a lock.